Israel which is involved in occupying of Palestinian Land and killing thousands of innocent Palestinian civilians has once again launched attack on Gaza resulting in deaths of Dozens of Civilians including many babies. Hundreds of people are also injured in Israeli Air Strikes on Gaza. 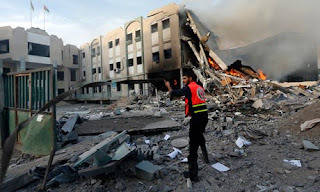 Israel again used the same old excuse of rocket attacks to launch serious attacks on Civilian population of Gaza. on other hand Egypt's Prime Minister has visited Gaza on Friday and asked Israel to stop attacks on Palestinians. At least 6 Kids are also killed and many injured due to Israeli Air Strikes in Gaza. 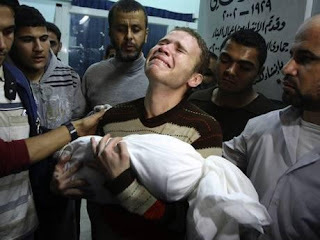 the 11 month old baby of a BBC editor is also among the babies killed in attacks by Israel on Gaza.